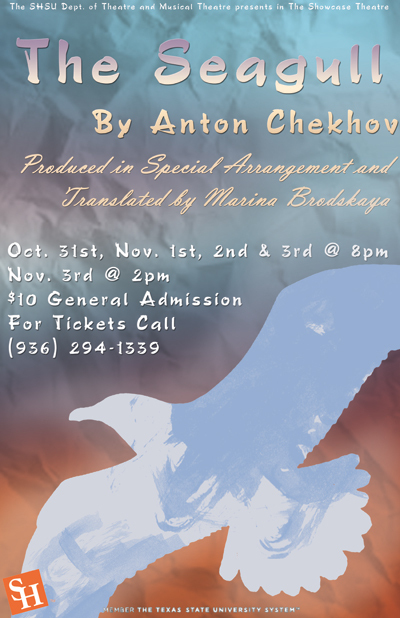 The Sam Houston State University Department of Theatre and Musical Theatre will present “The Seagull,” Anton Chekhov’s touching and humorous classic tale of unrequited love, Wednesday (Oct. 31) through Saturday (Nov 3). Show times for the play, translated by Marina Brodskaya, are at 8 p.m., with a 2 p.m. Saturday matinee, in the University Theatre Center's Showcase Theatre. Filled with humor and heartbreak, “The Seagull” is a play about the very human tendency to reject love that is freely given and seek it where it is withheld. The story focuses on a young aspiring playwright, Konstantin Treplev (Jonathan Teverbaugh), who desperately seeks the recognition of his famous actress mother, Irina Arkadina (Cheyenne James), and her lover Boris Trigorin (John Forgey), a renowned writer; yet both refuse to grant merit to Konstantin’s abilities. To make matters worse, the young artist professes his love for the beautiful 19-year-old Nina (Amanda Parker), the daughter of a rich landowner, and is crushed when she refuses to return his sentiments, instead indulging in a romantic relationship with Trigorin. The cast is completed by Melissa Molano, Tanner Stogsdill, Dakota Caraway, Robin Van Zandt, James Smith, Garrett Hayes Reeves, Sean Willard, Jo Jo Stafford and Rebecca Willett. When produced in 1898, “The Seagull” explored new dramatic forms. Chekhov called the play a comedy, but it was unlike anything that audiences had seen before. Chekhov also diverged from the high drama of the period, instead dramatizing the everyday circumstances like love, with characters experiencing major events off-stage, while presenting the event’s aftermath on-stage instead. The play takes place on a country estate next to a lake during a time in Russia when the upper class is on the decline. While the characters long to “be in Moscow” they either always return or don’t have a clue how to leave in the first place, according to McIntyre. Despite being a period piece, McIntyre believes that today’s audiences will have no trouble relating to the characters or what they’re going through. The production is designed by theatre faculty members Liz Freese (sets) and Eric March (sound), with music technical director Carrie Barton designing lights and theatre student Allison Forsyth designing the costumes.